Wow, March was a busy month! THHN welcomed lots of families, including four over the Easter weekend, and our fundraisers did us proud. And there are some fantastic events planned. Read on and get a taste of what we – and you – have been up to, and the difference it makes to families in sore need of a break from their everyday lives living with serious illness and bereavement. Sunday 26th June 9am at Paignton Green. 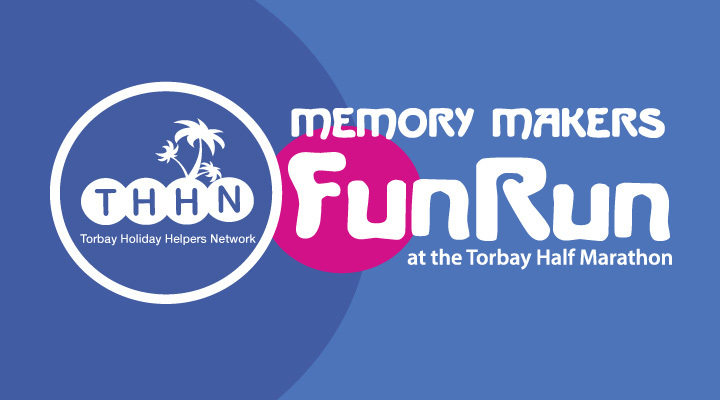 The Memory Maker Mile is one lap of Paignton Green on the same day as the Torbay Half Marathon. It uses closed roads and is run in front of the crowds watching the Half Marathon, this makes it an amazing experience and there is a unique medal for all Fun Runners. It is open to all ages and is just £5 entry. You can enter online at www.thhn.co.uk/funrun where there is also an entry form you can download if you cant enter online. You can enter on the day but get there early as entries close at 9am and its always busy. By entering you help THHN give families living with serious illness and bereavement, memory making holidays. Why not get sponsored to take part and raise more money for THHN? Lots of eager quizzers took part in THHN’s fantastic quiz night on 9 March, lots of fun was had with some serious and some fun questions, testing the old grey matter and raising a fabulous £287 for the charity. A big thank you also to the Babbacombe Inn, Tesco Babbacombe and the Animal Health Centre who donated prizes. This popular event will be back in October. Team THHN strictly marking quiz answers and Luke with the winning team. On 17 March, THHN founder Luke Tillen received a cheque for £300 from Paignton’s Miles Coverdale Lodge who hosted a unique Carol Concert in the underground chambers of Kent’s Cavern prehistoric caves to raise money for THHN in the run-up to Christmas 2015. Forty-strong Yours in Harmony, an all-ladies close-harmony a cappella chorus, entertained 80 guests who were then led on a guided tour of the famous Torquay caves where they enjoyed a candlelit sing-along. A special thank you to hosts Kents Cavern, the super ladies of Yours in harmony and to all those who donated so generously. Remember Chris and Ross who last year completed an epic-900 mile cycle through the French Alps and Pyrennes mountains in aid of THHN? Well, they’re at it again in 2016! This year they have plotted a 1,000-mile route from Land’s End to John O’ Groats and are giving themselves just 63 hours to complete it in – all for THHN! They’ll be setting off on the May bank holiday. To donate please go to www.justgiving.com. Even if you can only spare £1, your donation will mean the world to them and to Team THHN. Memory Maker Man & THHN Founder Luke have been down to see their good Friend Tom Chapman of Tom Chapman Hair Design, for their annual haircuts! Whilst there they had a good catch up with Tom and he told them all about his incredible new event – Hair Torquay, which will be raising funds for THHN and the The Lions Barber Collective. The event takes place on the 1st May at The Venue in Torquay. Tickets are available from Tom’s salon in Plainmoor, Torquay. Get your tickets as soon as you can, before they sell out! By supporting this amazing event, you are helping THHN to give very special memory making holidays for families living with serious illness from across the UK. THHN holiday liaison officer Angela Bunce recently met Ani Catt, the local coordinator for the fantastic charity Project Linus UK (www.projectlinuseuk.org.uk), whose volunteers make handmade patchwork quilts and blankets for sick or disabled children. Ani kindly donated ten beautiful quilts as gifts for THHN families visiting the area, and has offered more in the future. We are incredibly grateful for this generous donation and pledge of ongoing support. To prove that THHN fundraisers really do go the extra mile, In September Dudley Rae, founder of the fundraising organisation Viking Warriors, will be taking part in the Motoscape car rally. He and two professional drivers will be travelling through 12 different countries from Torquay to Prague, a distance of over 3,000 miles there and back, and all in a car costing no more than £300. Dudley will be the navigator – a challenge in itself as he has a severe sight impairment – and will be raising money for THHN and two other charities. Check out the challenge on www.vikingwarriors.co.uk. We wish Dudley and his team the best of luck. Brian Lewis and Andrea Kingdon, who organise beginners’ running courses in aid of THHN, welcomed their latest intake on 6 April. So far their inspirational ten-week courses, costing just £10 per person, has raised £1,300 for THHN. A huge thank you to both of them. A very big thank you to the residents of Stanley Court, who held an afternoon tea to fundraise for THHN. They raised an amazing £103. Easter saw six families welcomed to south Devon on special memory-making holidays. They stayed at Finlake Holiday Park in Chudleigh in our beautiful Memory-Maker caravan, the Marine Hotel Paignton, the Burlington Hotel Torquay and at THHN HQ the Hotel De La Mer in Babbacombe. A massive thank you to our providers of both accommodation and treats, including Riverford, Luscombes Butchers of Torbay, Halletts the Bakers, Tesco’s Babbacombe and Teddy Mountain UK, as well as to our staff and volunteers. Without them none of this would be possible. “We did so much and visited so many places, it was action packed. We went to the model village which is so cool, the beach in Paignton, had a lovely cream tea at Angels, went to Torquay Museum, saw the Railway Children film, had the best chips from Hanburys, went to Bygones, the play café and all enjoyed the entertainment on the evening at the hotel. We shared so many special times and memories as a family and laughed so hard (which has been a bit lacking lately!) we didn’t get home until 9pm last night as we were squeezing the last few hours out of our amazing holiday.” Other families stayed at Pilgrims Rest Cottages.